Do you encounter troubles with the process of window washing around your property? Your struggles are not enough to cleanse stains, water streaks and dirt from glass surfaces? The specialists of window washing in Leyton will render you assistance! Say farewell to the countless hours of polishing and wiping – the skilled and experienced team will handle this problem. You will be able to enjoy your free time – just let us do this slow and exhausting work for you. Our professional approach will grant you lots of bonuses. We also provide our professional services in nearby areas: Lea Bridge, Leyton Marshes, Upper Clapton, Snaresbrook, Cann Hall. You can count on the team - they are the true experts of window cleaning. They all have gone through complex training, so you can receive top-notch service for all window types. What we can clean includes: single, double, sash or bay windows, garden windows, patio doors, French doors, conservatories and skylights. Your property can freshened swiftly with our aid. Contact us any time you need great window cleaning for your home or workplace. The professionals of commercial window cleaning will provide you with excellent service for your workplace. We can reach as high as the fourth floor of your office with our water-fed pole system. If you have windows higher than that, we will perform the job with the help of our rope access equipment, designed specially for difficult to reach glass panes. 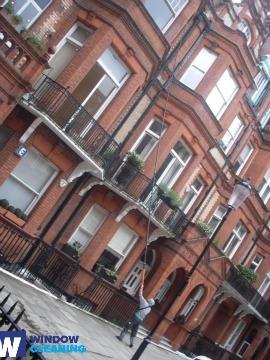 All things considered, you can rely on us for efficient window cleaning of all business property types - from small shops to the highest skyscrapers in London. We provide top-notch window cleaning by using next-generation techniques. We ensure impeccable and spotless look for your glass surfaces, skylights and greenhouses with water-fed extension pole system and jet washing. The poles we use are attached to water supply devices in our vans, thus eliminating the risk of damage to the exterior of your home or workplace. In addition, we use entirely safe rope access equipment to clean glasses on tall buildings. You can profit from these techniques today – give us a call on 020 3746 3113! With our fast and efficient domestic window cleaning in Leyton, you will enhance the look of your home immediately. We employ purified water for inside/outside cleaning of your windows. We make this possible by using ground based water-fed extension pole system, which is safe both for your dwelling and the cleaners. Discover more – call us on 020 3746 3113 or complete our online booking form. For your convenience we have a chat option. Our assistants are available 24/7 – you will receive answers to your questions. You can be one of our happy customers now!